Includes a free preview of future issues in the collection Founding Fathers Coloss. Coll. . For more information, please refer to the Satisfaction Guarantee tab below. If you do not wish to preview future issues in the collection, you may purchase the single item using the 'Individual Item Only' tab at right. When the fire of revolution ignited in the colonies, George Washington was chosen as Commander-in-Chief of the colonial forces during the American Revolution. History tells of his strength and leadership as beleaguered colonial troops battled against the mighty British armies. Where others might have given up, Washington fought on. After accepting the British surrender that ended the RevolutionaryWar, Washington thought he had done enough. He desperately wanted to go home and live a quiet life, but Americans would accept no one else to lead them. George Washington was unanimously elected as the first President of the United States of America. Called "The Father of Our Country, Washington led the nation with honor, pride, and dignity. His profound achievements and devoted service laid thevery foundation of this powerful nation. 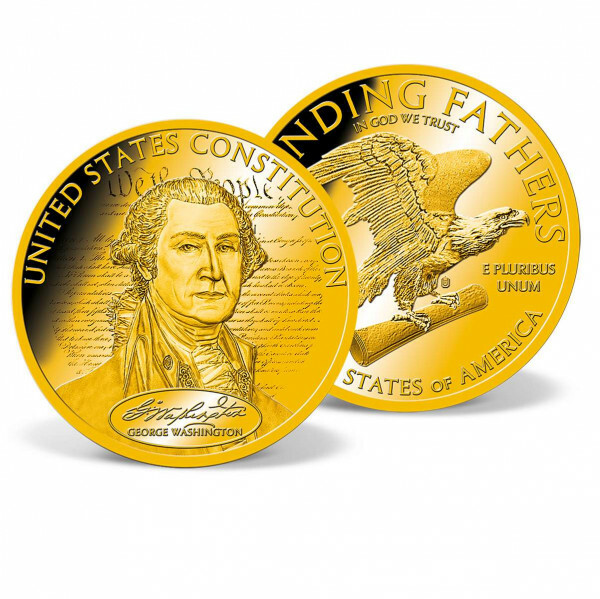 Available exclusively from American Mint, this incredible coin features an exquisitely detailed portrait of our nation's first President with the U.S. Constitution expertly engraved in the background of the obverse.